Bleach is a solution of a compound called sodium hypochlorite; sometimes calcium hypochlorite is called bleach as well. Both compounds dissolve readily in water and are highly alkaline. The Material Safety Data Sheet for Clorox regular bleach, for example, lists the pH of its product as 11.9. Chlorine bleach (a solution of approximately 3–6% sodium hypochlorite, NaClO) and ammonia, when used together, can have very harmful effects on the body. It is especially important to avoid exposing the skin or eyes to bleach when handling it, as such an exposure can cause severe tissue damage. The bleaching process was known to most ancient civilizations and has been around for thousands of years. Modern bleaches resulted from the work of 18th century scientists including Swedish chemist Carl Wilhelm Scheele, French scientists Claude Berthollet and Antoine Germain Labarraque, and Scottish chemist Charles Tennant. Many bleaches have strong bactericidal properties, and are used for disinfecting and sterilizing. Chlorine bleach is used to brighten white laundry and to remove stains and odors on non-porous surfaces. Chlorine dioxide is used for the bleaching of wood pulp, fats and oils, cellulose, flour, textiles, beeswax, skin, and in a number of other industries. Sodium thiosulfate also called sodium hyposulfite, sometimes shortened to thio or hypo, is used in pH testing of bleach substance. If one first adds sodium thiosulfate to the bleach solution, it will neutralize the color-removing effects of bleach and allow one to test the pH of bleach solution with liquid indicator. In the food industry, some organic peroxides (benzoyl peroxide, etc.) and other agents (e.g., bromates) are used as flour bleaching and maturing agents. Peracetic acid and ozone are used in the manufacture of paper products, especially newsprint and white Kraft paper. Two-part bleaches are utilized in the whitening of wood, especially oak. Severe skin and eye irritations and even chemical burns can occur as a result of contact with chlorine bleach and skin. It can also destroy melanin (pigment) in the body. Exposure of common household bleach to your skin is not likely to have immediate effects, especially if the bleach has been diluted with water, according to “CRC Handbook of Laboratory Safety” by A. Keith Furr. The longer the bleach is left on your skin, however, the more likely it is that you will begin to experience burning, itching and other types of irritation. However, it must be remembered that the extent of damage can be more significant than it initially appears to be. If the bleach is left on your skin for an inordinately long period of time, it can cause pigment lightening and permanent tissue damage. Stronger industrial formulas of bleach will produce the same results, only in a shorter amount of time. 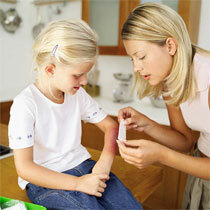 The immediate application of first aid is essential to minimizing skin damage. The Clorox Company, makers of Clorox Bleach, recommend addressing skin exposure by washing the skin with water for 15 to 20 minutes. Use a gentle cleanser to soak damaged skin. Moisturize with a gentle lotion to prevent drying and redness. If damage is extensive, consult a doctor for treatment. You also need medical attention if you show signs of shock; have an all-over body reaction; have a burn over an area bigger than 3 inches that penetrates more than your first layer of skin; or have burned your eyes, the area over a major joint, your buttocks, face, feet, face or groin. In addition, if you haven’t had a tetanus shot within the past five years, the experts at the Mayo Clinic advise you to get one because all burns are susceptible to tetanus. If you get bleach on clothing and it soaks through to your skin, remove the clothing first before rinsing. If no irritation develops, professional medical treatment is not necessary. Secure all chemicals, in and out of the home, in locked cabinets or out of the reach of children when they are not in used. When using chemicals, always follow directions and safety precautions on the label provided by the manufacturer. If you must be exposed to bleach, then you must be sure to follow precautions such as wearing protective clothing and keeping bleach inhalation and contact with skin to a minimum. Wearing gloves when using chlorine bleach is a good step to prevent direct contact and only use it in a well-ventilated area to prevent damage to the respiratory system. Clean with all-natural cleaners made with non-toxic ingredients. Chlorine bleach is an effective cleanser with many uses. However, bleach has been proven to cause adverse effects to skin, eyes and even respiratory systems. In addition to the household variety, there are also several formulations of more potent industrial bleach, and their health risks are even greater. This entry was posted in Oral Care and tagged Carbamide peroxide, chemical burns, chlorine bleach, chlorine dioxide, peracetic acid, pigment, sodium hypochlotire, sodium thiosulfate on August 19, 2011 by chzechze.